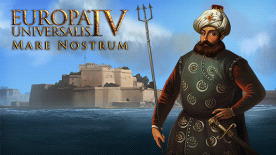 Mare Nostrum is the newest expansion to Paradox Development Studio’s best-selling historical grand strategy game, Europa Universalis IV. You now have even more tools at your disposal as you guide your nation through the early modern world. As its name suggests, Mare Nostrum introduces new systems connected to naval warfare and control of trade. The power of your fleets will depend on the number of sailors your nation can gather, and your ships can now be given missions and areas to patrol. There are also new options for creating trade leagues, and a host of other improvements. Map Sharing : This is a new diplomatic action, where you can ask other nations for their map of a certain region. Naval Missions: New mission system makes it easier to send your fleets to a region, and expect them to survive. Barbary Pirates: North African Muslim states can raid the coastlines of their neighbours for gold and sailors. Trade Leagues: Merchant Republics can create trade leagues for mutual defence and mutual profit. Condottieri: Nations can rent their armies out to fight in other people’s wars, earning valuable coin for the realm. LEGAL: © 2016 Paradox InteractiveTM. Trademarks belong to their respective owners. All rights reserved.